As an administrator, many a time you would have felt mundane routines spill over crucial attention-seeking jobs of your network. Patch Manager Plus answers this concern through its User & Role Management module; delegating routine activities to chosen users with well-defined permission levels. You can easily administer the users, and define their scope to manage a specific set of computers. 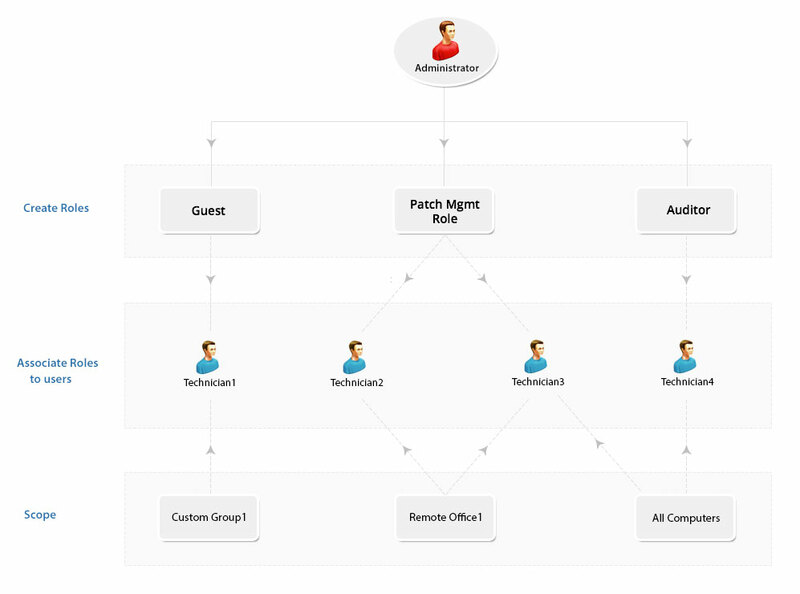 You can tailor-make any number of roles, using Patch Manager Plus and give them permissions of your choice based on your personalized needs. These customized roles fall under the User-defined category. For a better understanding let us quickly see how to create a User-defined Role in the following section. 1. Select the Admin tab and click User Administration, under Global Settings. This opens the User Administration page. 2. Select the Role tab and click the Add Role button. 3. Specify the Role Name and a small description about it. 4. You can define module-wise permission level for the Role in the Select Control Section. You have successfully created a new role. The role you have just created will now be available in the Roles list of the user creation module. Role deletion cannot be performed if that role is associated even with a single User. However you can modify the permission levels for all User-defined roles. Administrator Role: The Administrator role signifies the Super Admin who exercises full control, on all modules. There can be only one super admin for an org, incase the super admin leaves the company, you can re-assign any administrator as super admin, however this can be done only by logging in as super admin. A super admin will also have privilege to move users from one org to another. Guest Role: The Guest Role retains the Read Only permission to all modules. A user who is associated to the Guest Role, will have the privileges to scan and view various information about different modules, although making changes is strictly prohibited. Guest Role also has Read Only permission for viewing, details on patches management. Can define and deploy all patch configurations and tasks. Can view all the patch configurations/tasks, including those created by other users, reports, etc. Can suspend, modify, or re-deploy the configurations/tasks defined by them. Can update the Vulnerability Database. Has write permission to perform patch management tasks. Auditor: The Auditor role is specially crafted for Auditing Purposes. This role will help you grant permissions to auditors view the details of patch summary and reports. Users with "Auditor Role" is limited to read-only access. Patch Manager: The Patch Manager role has complete access to the Patch Management. Patch Manager will also have privilege to access to perform tasks, like Wake On LAN, and ability to schedule Patch Reports. Patch Manager Plus provides you the privilege of defining a scope for the users, which means you can define the target computers, which can be mapped to every user. By limiting the user's permission to specific set of computers, you can feel assured that the user has enough permission to perform their roles and not excess permission to take unduly advantage. When the target is defined as 'All Computers', user will have permission to execute all the privileges defined in the role, to all the computers. Though the scope is all computers, the permission level is determined only by the role, to which the user is mapped. You can create specific remote offices or use the existing remote offices to be defined as the scope for the users. More than one user can have manage the same remote offices. Similarly more than one remote office can be mapped to the same user, however you cannot have a combination of remote offices and unique groups as a part of the scope. When a scope of the user is modified, user will not be able to manage the configurations/tasks, which were created by him. He will have permission to clone the configurations without the target, so that he can re-use them for his current scope. Modifying the computers within the scope will not be considered as modifying the scope. Define the Scope for the user, you can specify the computers, which needs to be managed by the user. You can choose to provide the user access to manage all computers, remote offices or specific unique custom groups. If you do not have a unique custom group, you can create one. If the custom group is not unique, it will not be listed here. You have successfully create a user and associated a role to the user with the scope of the computers that need to be managed. When you opt to authenticate a user via Active Directory, the user should have privileges to login to the domain from the computer where Patch Manager Plus Server is installed. Patch Manager Plus offers the flexibility to modify the role of users, to best suit your changing requirements. You can do operations like Changing the User Role and Reset User Password at any point of time you feel you should. Enabling Two Factor Authentication will secure the access to Patch Manager Plus web console. Users will be prompted to enter the One Time Password (OTP) along with their default password. You can configure the settings to save the OTP for the specific browser. If this option is enabled, user will not be prompted for OTP for the number of days, specified here : Admin -> User Administration -> Two Factor Authentication. You can choose the mode for two factor authentication, which could be via email or Google Authenticator. One Time password will be sent to the each user via email. You can not enable Two Factor Authentication, if one or more users do not have email address mapped with Patch Manager Plus server. You will have to ensure that email address of all the users are registered in Patch Manager Plus server. When two factor authentication is enabled, users will receive an email with the details of the OTP. Every OTP is valid for 15 minutes from the time of generation. OTP will be an auto-generated 6 digit number. You can also allow the users to save the OTP on their web browsers. You will have to specify the number of days allowed, for the OTP to be saved on the web browser. Users will not be prompted for OTP, if they choose to save the OTP on the browser. If you specify the number of days as 0, then users will not be allowed to save the OTP on the web browser. OTP will be generated every time the user tries to login into Patch Manager Plus web console. Download and install the authenticator on the mobile device. When you can login to Patch Manager Plus web console for the first time, a QR code will be displayed. You will have to open the Google authenticator app and scan the QR code to create an account for Patch Manager Plus. You can see Patch Manager Plus is now added to the Google authenticator app and OTP will be generated automatically. You can use the OTP generated in the google authenticator as the secondary authentication and login to Patch Manager Plus. If the user have deleted the Patch Manager Plus account on the Google authenticator, then the user will should contact the administrator to restore Two Factor Authentication using Google authenticator. Administrator can re-send the QR Code to restore the Google Authenticator from here : Admin -> User Management -> Actions (Under the appropriate user) -> Re-send QR Code. A Unique Custom group can be managed by more than one user. User A creates and applies the configuration/task to Static Unique Group 1. This configuration will be visible to User A, and User D, since they share the same scope (Static Unique Group 1). This configuration can be modified by User A and User D. When user D modifies this configuration, the target of this configuration will list only the scope that is being shared by User A and User D.
User D creates a configuration and applies it to Static Unique Group 2, then this configuration can be viewed by user User B, User C and User D. All the three users will be able to manage the configuration. User D creates a configuration and applies it to Static Unique Group 3, and Static Unique Group 4. In this case, User C and User D will be able to view this configuration. User C cannot make any changes to this configuration. User A creates a configuration and applies it to Static Unique Group 1 and later, user A's scope is modified, then this configuration can only be viewed by him, or cloned as a new configuration without the target.